With a history spanning over 80 years, Martin-Baker is still run by the late Sir James Martin’s descendants to this day. Originating as an aircraft manufacturer, Martin-Baker’s passion has evolved over the decades, now focussing on an issue very close to both ours and our founders’ hearts. 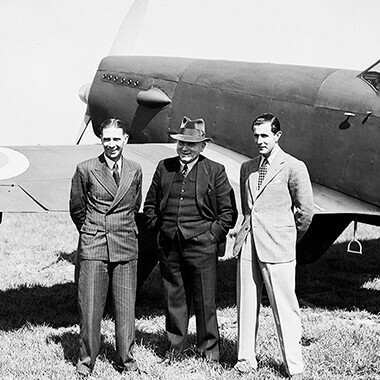 Sir James Martin, an Irish immigrant and innovative engineer, began producing aircraft in 1929. He had always had a great desire to invent and make things with his own hands and, by dint of hard work and continuous study, was an accomplished engineer even in his teens. It was whilst producing the MB1 that Sir James’ friendship with Capt Valentine Baker was established, giving birth to Martin-Baker Aircraft Company Ltd. Capt Baker’s years of flying experience and incomparable skill was of great importance in the development and flight-testing of the company’s prototypes. In 1942, during a test flight of the Martin-Baker MB3 prototype, Capt Baker was tragically killed. The engine seized and he was forced to make an emergency landing – the wing tip struck a tree stump, causing the aircraft to cartwheel. His death greatly affected Sir James, who dedicated the rest of his life, and the future of their company, towards pilot safety. An intrepid employee, Bernard Lynch, attempted the first static ejection on 24th January 1945. He then conducted the first mid-flight test ejection on 24th July 1946. He ejected himself from the rear cockpit of a specially modified Meteor 3 at 320 mph, 8000 ft in the air. Bernard Lynch made a perfect landing and subsequently made a further 30 ejections. The first live, non-test ejection took place on 30th May 1949 by Jo Lancaster. Jo was flying an Armstrong Whitworth AW52 aircraft and was forced to eject using a pre-Mk1 ejection seat over Southam, Warwickshire. From that day until now, Martin-Baker has saved the lives of more than 7,500 aircrew members. For a more in-depth insight into our history and milestones, why not take a look at our company’s timeline?